The hook and loop closure version of this is here. The Newborn snap version is here. The elastic is so soft and stretchy and the design is great. The "feel" of it is just right. I do think it is best at 4 or 5 months and up though. Like any "one-size" item, it's really quite big on a young baby. 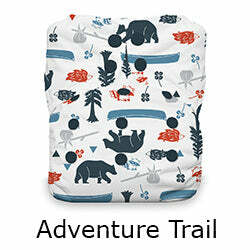 Natural fibers inside, this one-size fits most all-in-one diaper is made in the USA. 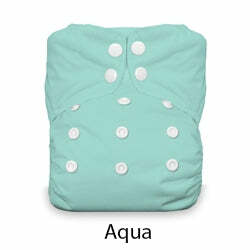 This easy-to-use cloth diaper includes 11 thirsty layers of natural fibers: 3 layers of organic cotton in the body and 2 soaker pads with 8 layers of the same hemp/organic cotton. As with all "one-size" items, they are really quite huge on brand new babies. 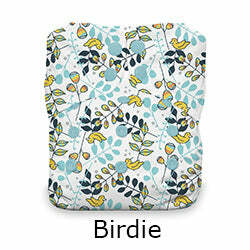 I like them (all kinds of one-size things) starting after the newborn time, perhaps 11 pounds and up and choose newborn sized items for my brand new baby. Made in USA. The prints are so much lovelier in person. 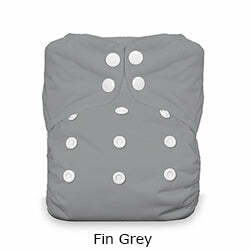 Fit baby well and easy to use. 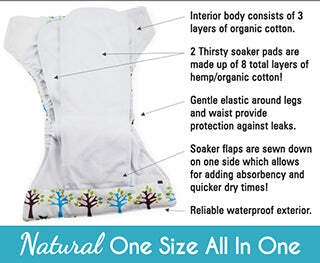 Thirsties Natural AIO are my favorite cloth diaper! They fit my daughter, who is on the tall & skinny side, perfectly. 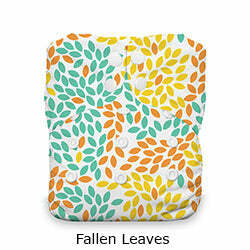 They are the trimmest of all the diapers I’ve tried. 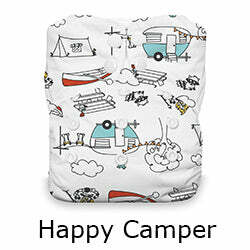 I love that they’re made in the USA and that the interior is made of natural fibers. I do find that they are prone to staining more than my microfiber diapers, but it usually comes out in a couple washes or by sun bleaching. 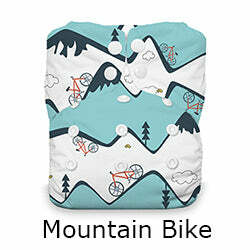 I just love these diapers! Thanks, Thirsties, for a great product! 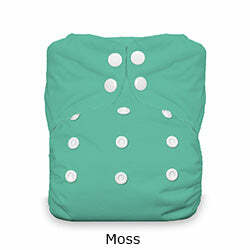 These natural cloth diapers are super absorbent and has a nice trim fit on my 19lb 6month old. We are a thirsties family with the fun and colorful prints that last. I’ve tried many brands and just reach for these! I bought two of these in Palm Paradise and Tortuga. 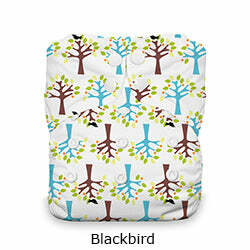 I have never owned Thirsties diapers, but I really loved those new prints. After reading great reviews, I decided on the Natural AIO. 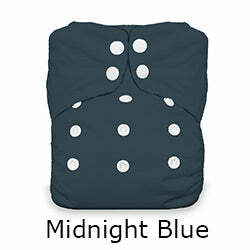 I was nervous trying out a new brand of diaper after being disappointed with other brands, but I am pleasantly surprised so far. I think I may be adding more of the NAIO to my stash! 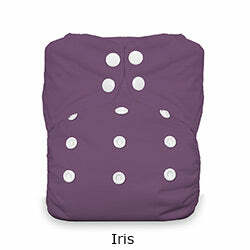 I really love this... it is very absorbent and when I get some more money I want to get a couple more! !